First I said it was just too damn much… – “€20 for a brunch?! You mean like… €20 for a simple breakfast??!!!”. But then, as I entered the big room with view of the old bridge, as the sunlight was passing through the windows, my jaw dropped. I shut my mouth and started a whole meal that would put any calorie counting freak doing advanced mathematics in a flash. What can I say. For me, this is the best brunch in town. It has everything you could think of for an amazing breakfast: Pancakes with jam, fresh salads, crostinis, croissants, cakes (from their own bakery), lots of cheese and besides all that, some Asian specialties like gyozas – This is the Oriente Museum after all! 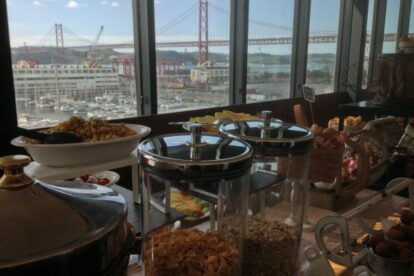 I could say that this brunch is way better than some 5 star hotels’ breakfast, and since they work in 2 different shifts, you can book the 14:30 – 17:00 slot and you can skip lunch. There’s hot dishes as well (last time I had salmon with pasta). If you’re bringing your baby, there’s a Kid Corner with a babysitter included so you can stop thinking about diapers for a moment and give your loved one some attention! And for an additional € 3 you could buy a whole brunch-museum entrance ticket – cherry on top!